Good morning! We hope you are planning to join us for our Easter breakfast and service this morning. The breakfast begins at 9:30 in the fellowship hall downstairs and will be serving until about 10:15. Then our Easter service will start at 10:30 in the sanctuary. Pastor Gabe will be bringing a message from Luke 24. In John 11:25-26, Jesus said, "I am the resurrection and the life. Whoever believes in me, though he die, yet shall he live, and everyone who lives and believes in me shall never die. Do you believe this?" Come at 6:00 for our hour-long Good Friday service, remembering the death of our Lord and Savior, Jesus Christ, on the cross for our sins. Following the service, we will meet downstairs in the fellowship hall for our potluck. Bring something if you can. Stick around and enjoy some good food with us! We'll have one more evening service Saturday at 6:00. Then on Sunday our Easter breakfast starts at 9:30 with the service at 10:30. Our Passion Week services begin on Palm Sunday and go through Saturday, March 26, with holy week services each evening at 6:00. The sermons correspond with something that happened in the week leading up to Jesus's crucifixion: on Monday, Jesus cursed the fig tree; on Tuesday, he delivered his Olivet discourse, and so on. Wednesday evening, we'll have our fellowship meal at 5:00, and a service for the kids during church at 6:00. Those who are in AWANA are still welcome to bring their AWANA stuff. On Thursday, we will talk about Jesus's last meal with his disciples and partake in the Lord's supper. On Good Friday, we will have a potluck at 7:00 immediate following the service. Saturday will be our final evening service. All services will be one hour. 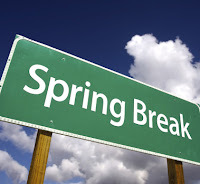 This week is Spring Break for the schools in our area, so we will not be holding any of our usual weekly activities here at the church. No Bible Lunch Tuesday, no AWANA, and none of our homeschool co-ops will be meeting. On Wednesday, there will be no activities in the evening, not only AWANA but also our fellowship meal and adult Bible study. Don't forget that next week is Holy Week, and we've got services every night at 6:00! Click on our calendar for more information. This morning, we will be studying Romans 12:1-2, and looking at chapters 1-11 in view of the mercies of God talked about in chapter 1. In that process of review, we will be highlighting key passages throughout those first eleven chapters of Romans. Pens and highlighters will be offered if you do not have a particular pen or highlighter of your own. Bring your Bible, and let's do some study! Also prepare your hearts for participation in the Lord's Supper.